A new intercontinental ballistic missile (ICBM) so secret it has no name yet has been successfully tested in Russia, the defence ministry says. The new weapon is designed to penetrate Nato's European missile defence shield, Russian defence sources told the Interfax news agency. The test came days after Nato said its system had reached "interim operational capability". The missile carried a dummy warhead and was fired 6,000km (3,730 miles). It was reportedly the second test of the missile, the first in September having failed. The test came days after Nato activated its new missile shield in Europe. The alliance announced the new ballistic missile defence system had reached "interim operational capability". Moscow has accused Nato of seeking to undermine its nuclear deterrent but the alliance says its shield is aimed at potential rogue states like Iran. A mobile launcher on the Plesetsk range fired the new missile at 10:15 (06:15 GMT) on Wednesday, defence ministry spokesman Col Vadim Koval said. The warhead was delivered successfully to its designated area on the Kura range on Kamchatka, he added. A military source quoted by Interfax said the new ICBM used a "new type of fuel that helps reduce the time required to operate the propellants in the active stage of the rocket's trajectory". Officials believe this makes it more difficult to detect and easier to manoeuvre. 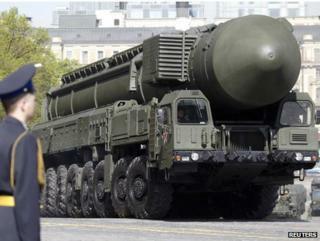 Interfax said the weapon also features individual warheads that can change course to avoid being shot down. "This is one of the... measures being developed by Russia's military and political leadership in response to the US deployment of a global anti-missile system," former strategic forces director Viktor Yesin told Interfax. Nato says its shield is meant to protect members from a missile fired by a rogue state - understood to mean Iran. It plans to increase its capability by deploying further assets in the years ahead. However, Russia says the shield upsets the military balance and has threatened to turn its missile launchers on vital Nato sites.